I realized this morning that it was only a year ago that I switched from publishing my “Connecting Design Threads” newsletter to blogging three times a week. The old cliché Time flies when you are having fun definitely applies here. Where did the time go? I recall apprehension from loyal newsletter subscribers, at times even strong opposition (received in the form of personal emails), yet little by little newsletter subscribers signed on as “followers” and comments began to appear at the bottom of most posts. I am thrilled that I made the transition and that you had enough trust in me to follow and continue to support my endeavors. This marks the 204th post since I signed on to WordPress, my first choice for a blog host. 1,648 comments overall are proof enough for me that my efforts have been well received. In comparison the newsletter warranted up to five comments a month and after six years that adds up to a lot less than this forum’s comments. I appreciate your steadfast support, your encouragement and patience as I move forward with this way of communication. I continue to learn and my commitment to share knowledge remains my main focus. As the wintery landscape begins to melt away and welcomes spring, Easter arrives on our doorstep. It is time to celebrate! I am launching a new contest on Easter Sunday. Check back for details on how to win an original framed artwork… Let the excitement build and ensure another year of active blogging and commenting! 28 Mar	This entry was published on March 28, 2013 at 9:20 am. It’s filed under Announcing New Contest, Creativity Update, History, Journaling and tagged Announcing new contest, blogging vs. publishing a newsletter, Easter, loyal blog followers, new contest, sharing of knowledge, support, Thank you, Wordpress. Bookmark the permalink. Follow any comments here with the RSS feed for this post. I think the” thank you” needs to go to you Anna for posting the most interesting articles, photos and continuing to inspire us! Thank you, Linda! This blog would not exist and be half as much fun if it weren’t for all of you. Have a happy celebration for Easter. Just to let you know I have started one of my works for June of my source. It has developed differently than I had in mind but think it will be ok. Here is hoping that spring is really here and we can get on with looking forward to the summer days ahead. Smile and hello to Colin too. Thank you, Leona! Happy Easter right back to you and your family! Anna, most of my thoughts have already been spoken above. I am an avid follower who took a shibori class from you in Duncan, BC years ago. Your generosity with your knowledge and experience is a breath of fresh air. So many hold their skills and ideas close to their chest, worried that someone might “steal” them. Dawn, it is so nice that you sign in with a comment. Thank you for taking the time. I have such fond memories of the Shibori class in Duncan during February of 2006.I always love to hear from my former students, especially when they have accomplishments of their own to share. There is no need to “guard secrets” – as you know and agree: I advocate originally by using new skills, exploring them and truly moving them into one’s own creative space and expression. It’s all about support and sharing! The photo of dew-kissed fireweed blossoms is nothing less than utterly exquisite Anna. What a perfect symbol for celebrating the first anniversary of your Blog. Thank you for inspiring us with this colourful and uplifting photographic capture midst of all the snow. Thanks, Judith – the anniversary is actually to celebrate my switch from a monthly newsletter to blogging exclusively. It is quite informal, really – I was just reminiscing about my initial indecision to switch. I have learned so much and continue to seek knowledge, that is truly what blogging is all about! I think your blog is fabulous. The photos always make my day! Can’t believe you have time for three times a week. You are amazing. Happy Easter from Sun Peaks. Thanks so much, Gillian. Happy Easter – I understand you are chasing more snow this weekend? Enjoy! Thanks for all you do. I have learned so much about art, design etc. It is like I decided late in life to take a university class. Katine, I am so glad you continue to enjoy the blog and find the information useful. I am excited and energized – there is so much more to share! I really think that the ‘Thank you’ needs to be coming from myself as an regular follower of your blog. I often take your comments to my art quilt group too! I don’t always comment on every blog but be assured that I am there, avidly reading. And your photos are a whole other subject – they are so beautiful. Love today’s flower! Karen, if you continue to share what I post we both benefit! And the thank you goes to you and everyone who keeps the knowledge moving! Thank you – the credit goes to Mother Nature! 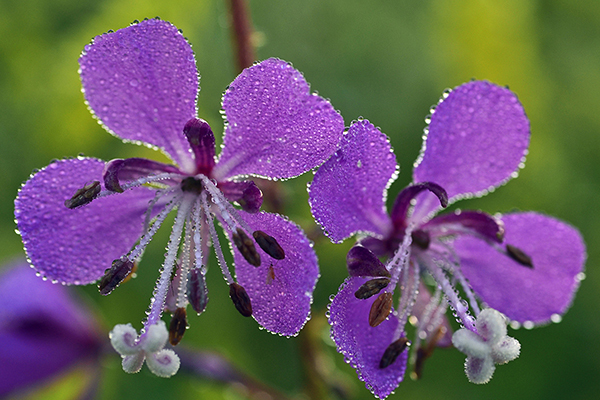 It is a close up of Fireweed, captured one early morning in July 2012.